Need LG Allergiene Steamwasher Model WM3001H Reviews & Ratings? Recommended Buy. With 4.5 cubic feet of capacity, the LG WM3001H washing machine (List $1,599) can handle huge loads and keep up with the biggest washers on the market. 4.5 cu. ft. can easily accommodate king size bedding or the equivalent of 50 adult sized T-Shirts in one wash. 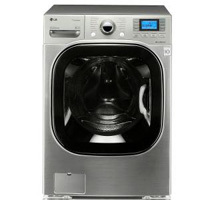 This being LG's flagship washers the WM3001H packs some extra features including Steam Wash, a blazing fast 1,300 RPM spin cycle and 9 wash cycles. LG claims to have invented true steam washers, technology which allows the LG WM3001H to eliminate tough stains, reduce certain allergens such as dust mites and animal dander and also relax wrinkles. Due to the huge drum size and LG's SteamFresh technology, you can SteamFresh up to 5 garments in one 20 minute cycle. The washer is available in three colors including white, Red and silver. Energy Star rates this unit at a super efficient 139 kWh/year, way below many other Energy Star rated front loaders. This LG Washing Machine offers separate compartments for bleach, detergent, softener, and pre-wash detergent. The washer has a quick wash cycle that cleans in less than 20 minutes for loads with minimal stains. Water levels automatically adjust based on size of your wash. A tub cleaning cycle also helps reduce grime build up. Allergiene steam cycle is great for cleaning bedding materials. Standard full cycle time is 105 minutes, well above average. In terms of overall value, you really get what you pay for on the LG WM3001H. #1) Large Drum Capacity: With 4.5 cu. ft. of volume washing king sized comforters is no issue. This unit will easily meet the load requirements of any large family. #2) Great Reviews: Great overall LG WM3001H reviews by both leading washing machine review publications and user reviews. Pro's commonly noted on efficiency and washing performance. #3) Energy Efficient: Uses only 139 kWh/year. Water levels adjust according to wash size. 1,300 RPM spin speeds remove more moisture and require less clothing dry times. This also helps this washing machine meet ENERGY STAR Qualifications. #4) Steam Cleaning: Allergiene cycle reduces up to 95% of allergens including dust mites and animal dander. SteamWash system helps penetrate tough stains with less use of water, attributing to the LG WM3001H's energy efficiency. #5) Great Cleaning: LG's SenseClean system analyzes wash cycles and adjusts for intelligent fabric care. #1) Vibration: TrueBalance Anti-Vibration system does an adequate job, but higher expectations were had at this price point. #2) Good Gentleness: All the features used to fight tough stains can put added stress on your clothing. If you're looking for LG quality and a ton of features, including steam cleaning, its tought to go wrong with the LG Allergiene SteamWasher WM3001H(W) Front Load Washer. At its core this a solid washer and has received incredible user reviews and leading consumer review publication endorsements.